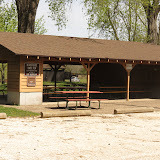 Riverside Shelter is located in the very popular Riverside Picnic Area in Pinicon Ridge Park. With adjacent playground, sand volleyball and horseshoe courts - the location along the backwaters of the Wapsipinicon River puts this facility much in demand during the warm summer months! This facility is located on the "day use" portion of Pinicon Ridge Park, accessible from the south park entrance off Maine Ridge Road - directly west of Central City, IA. On Maine Ridge (west of Hwy. 13), turn right (north) into the park on Horseshoe Falls Road. Follow the main park aroad (and associated signs) to the Riverside area of the park, and the shelter is just off to your right near the playground complex. Address is 1791 Horseshoe Falls Rd., Central City. $50.00/day Friday, Saturday, Sundays & holidays; $35/day Monday through Thursday. For all fee and discount information, click here. Riverside Shelter is a seasonal facility, available for reservations from 7:00 AM to 10:00 PM daily from April 15 thru October 15. (NOTE: When not reserved, the shelter is available on a first-come, first-served basis). The area surrounding Riverside Shelter is prone to flooding during moderate high water episodes on the Wapsipinicon River. If flooding occurs, the shelter may be closed.